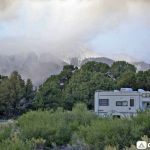 Pinyon Flats Campground is a National Park Service campground located one mile north of the Visitor Center. 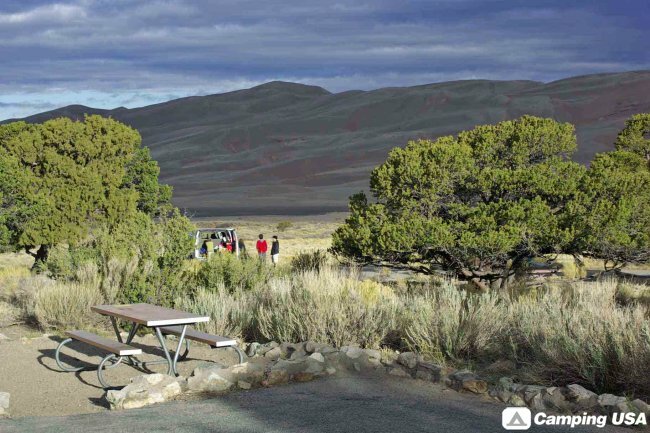 While Loop 1 (44 sites) will remain first-come, first-served, Loop 2 and the three group campsites are now reservable through the National Recreation Reservation System. 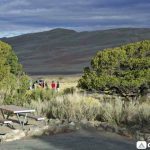 The park will no longer accept phone reservations for group campsites; all reservations now go through the national system. Contact the National Recreation Reservation System online, via email, phone: 1(877) 444-6777, or Fax: 1(518) 884-7424. For questions about the campground, please call the Visitor Center at 719-378-6399, or send an email. 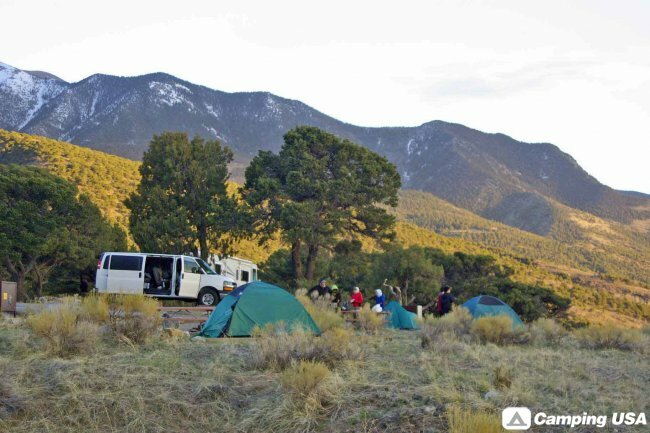 Pinyon Flats Campground has 88 individual sites located along two loops. Individual sites are $14 per night for 2010, whether reserved or walk-in. Restrooms have sinks, flush toilets, and a sink for dishwashing. Each site has a fire grate and picnic table. Some sites have large cottonwood or conifer trees for shade, while others are more out in the open with smaller pinyon trees. 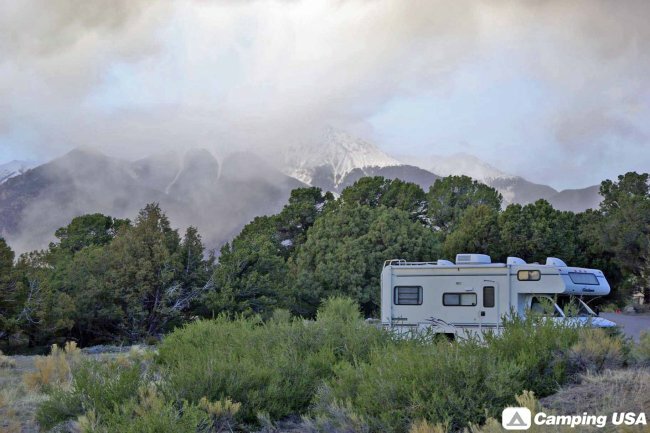 A few sites can fit RVs up to 35 feet in length; see more information on RVs below. Loop 1 (44 sites) of the campground is open year-round; one restroom is winterized. 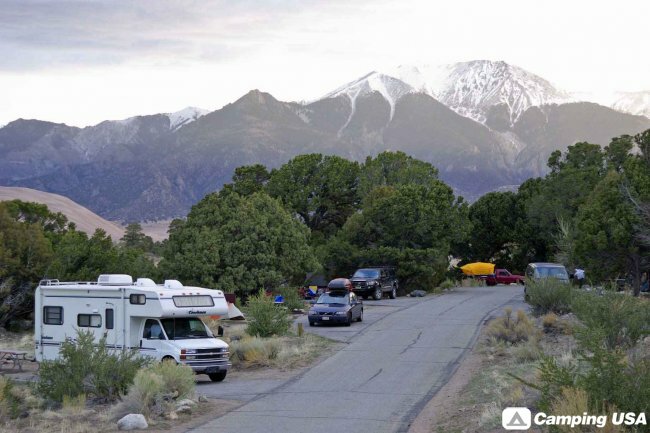 Most campsites have a capacity of six people, two tents, and two vehicles (including towed vehicles/trailers). A 50% discount applies to Golden Age and Golden Access pass holders. When Medano Creek is flowing, expect reservable sites to be booked and walk-in sites full by mid-day every day of the week. Plan your visit on a weekday to avoid especially large crowds and full parking areas. Loop 1 (sites 1-44) of the campground are first-come, first-served year-round. To acquire a site, you must have one motor vehicle and one adult present for each site requested. 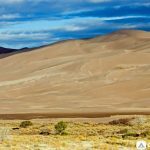 Sites will be assigned by a ranger, although you may request a specific site or type of site if it is available. 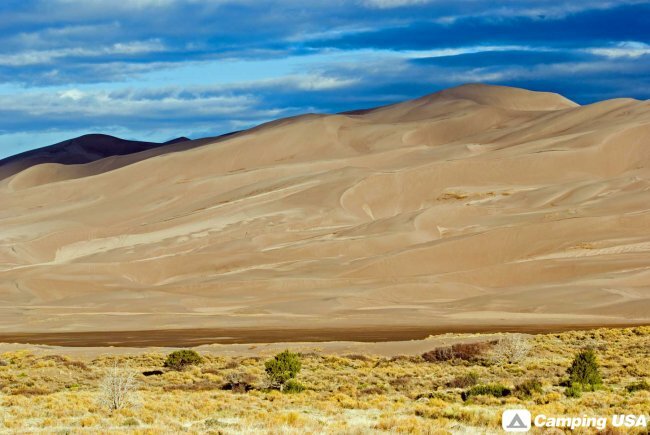 Saving campsites for people coming later is no longer permitted. Two vehicles (including towed vehicles/trailers) maximum at each site. Check-out time is 10:00 am. Loop 2 (sites 45-88) campsites are available for reservation May 15 -September 15. (Loop 2 is first-come, first-served in spring and fall). Sites may be reserved up to 6 months in advance, but must be reserved at least 4 days in advance. Sites not reserved will become available as first-come, first-served. Because of the reservation system, check-out time is 10:00 am. RVs: Some sites can accommodate RVs or camping trailers up to 35 feet in length. However, there are no electrical, sewer, or water hookups. A dump station and water hoses are available in warmer months near the campground. 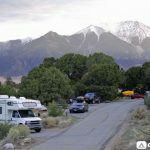 Drivers with RVs longer than 35′ will find it difficult to turn corners or clear tree branches, and should consider other area campgrounds. RVs, trailers, and pop-ups will not fit and are not permitted in the group tent camping sites. Group tent camping sites are available by reservation only. Group sites are now reservable up to 1 year in advance, but must be reserved at least four days in advance. Three group sites are available in Loop 3, located just east of the individual campsites. Groups of 15-110 people may be accommodated if space permits. RVs, pop-ups, and trailers do not fit and are not permitted in the group tent camping sites. The month of May and summer weekends book up very quickly. Each group site has 7-8 car parking spaces. 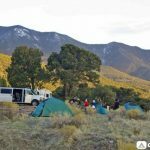 Groups with more than 7 vehicles or with RVs or pop-up campers should consider other area campgrounds.